Why the Need for Smart Roads? Nowadays, people always tend to think of mobile technology when they hear the term “smart” as part of a word. We have smart phones, smart cars, smart watches and smart cities to reflect our progress in urban development. So, what about smart roads? And while the idea of urbanization sounds ideal, we must remember that the development of the modern city has led to an onslaught of byproducts. Our cities have become congested, filled with pollution and characterized by wasted energy. The goal of creating the smart city is to address these byproducts of urbanization with viable solutions that integrate modern technology. But creating the smart city alone is not enough if the roads are still behind the times. To meet the growing demands of the modern city (and even the inevitable smart city), the way we construct roads will have to take into consideration the negative byproducts our modern society has caused on today’s roads. We need roads that can make intelligent decisions to ensure we have a safer and more efficient journey each time we decide to travel by road. In other words, we need roads built to make our lives better and more efficient. And guess what? We are well on our way to seeing the world where all roads will have smart technology. A Road Is Just a Road, Right? When we look at the typical road, we see a structure that doesn’t have much technology involved in its design. The main purpose of a road is to get us from one location to another, so the science behind creating a road does not have to be complicated to do that. But what about the possibility of our roads doing more to make life safer and easier while traveling? Thanks to the wide acceptance of “smart” technology, there’s no surprise that roads would be next on the smart technology agenda. 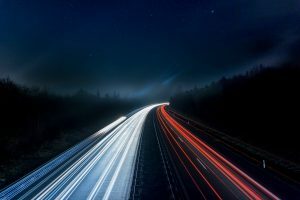 Trends in “diverse mobility, autonomous driving, electrification, and connectivity” have become the hallmarks of a society that has made digitalization a popular industry. Therefore, the inclusion of smart roads to meet this digital demand is an inevitable step in a technological society. We have the technology to make smart roads happen, so now all that needs to be done is to capitalize on what’s already available to catch our roads up with the technological advances of our cities. The concept of smart roads is to establish “road systems that attempt to reduce the frequency and impact of human error.” So, you can expect a smart road to be more involved in the everyday traveling experience. It will contain sensors to anticipate human behavior on the road and to help with climatic trends. Roads will be able to gather data from cars, bikes, traffic signals and cities to make the roads a better place. Roads of the future will “think” and interact with today’s traveler. The connectivity of smart roads will ensure that travelers are able to travel faster, safer and better than they were able to do on the old concrete model. The byproduct of smart roads will be a world that is safer and easier on the environment. UK imports and exports: what have we really got?